The San Francisco Treat: A Few Days in the City By The Bay | Thank You. Cooperate. “Dude, put a spoonful of this stuff in it,” said my bartender/server. The “stuff” he was talking about was a spicy mignonette with cilantro, lime, and habanero – and the “it” was Dungeness crab fat. 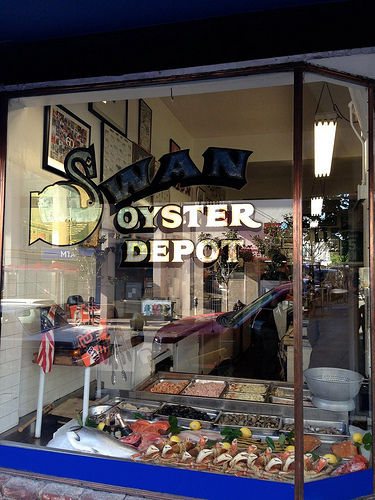 I am at, of course, Swan Oyster Depot. 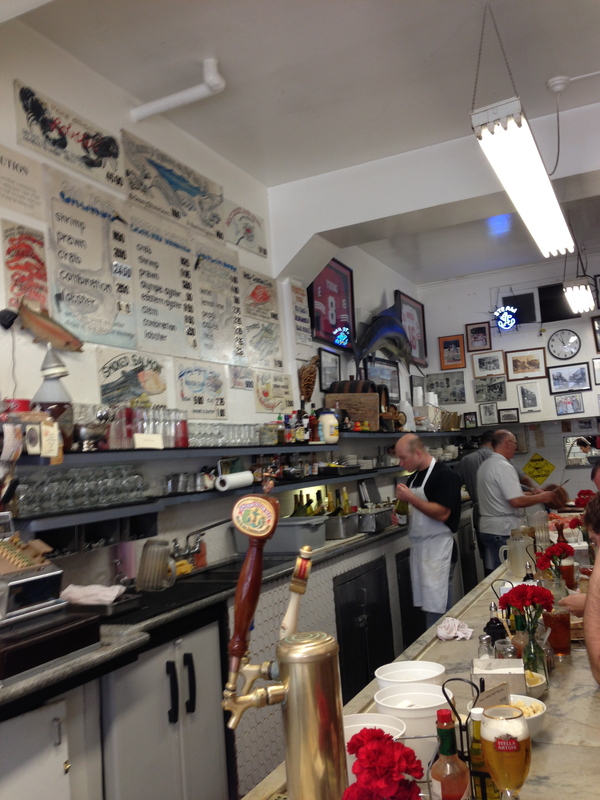 The legendary 18-seat seafood counter/bar in the Nob Hill area. I got there at around 10:30am on a Monday and there’s already a line. Luckily, I was number 16 in the queue so I got to sit down. “Getcha started with a beer?” Day drinking? Sure! “Chowder and some bread?” Why not! These longshoreman-looking dudes behind the counter are your cooks, servers, bartenders. Most of them have been here for decades and they know exactly what you need. 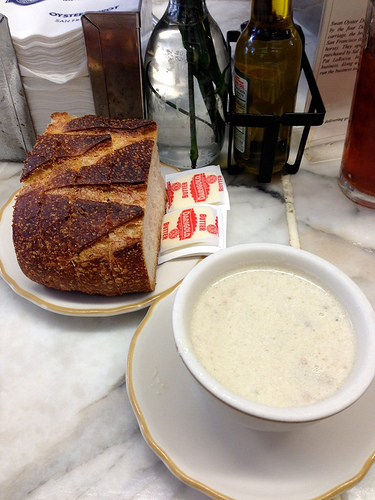 It’s almost a requirement to start with an Anchor Steam, clam chowder, and a chunk of sourdough. After that you’re on your own. 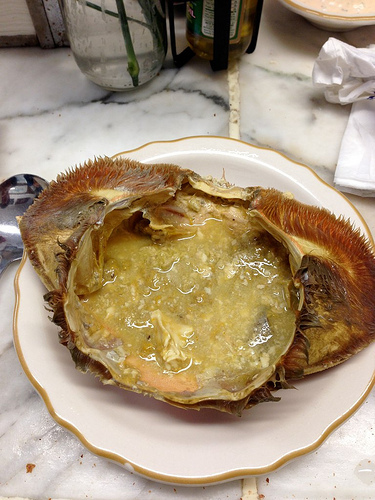 They have oysters, clams, seafood salads, smoked fish, cracked Dungeness crab legs, and of course, the crab fat. Start with some oysters. They’ll usually have a bunch of different kinds, so just ask for an assortment. 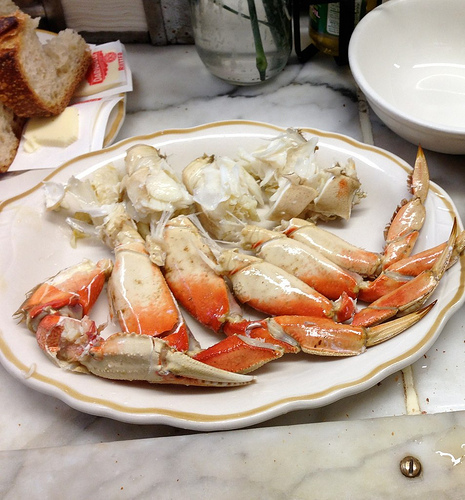 Then go with either a half cracked Dungeness crab or the crab salad. It all depends if you wanna do some work and pick the crab out of its shell, or have it without shell and served on some shredded lettuce. Either way, ask for a side of the Sauce Louis. It’s like a thousand island dressing only tangier and a thousand times better. If you’re less adventurous or just wanna eat more, order the smoked salmon plate. Served on a rye bread with some capers and onions, the salmon is beautifully fatty and silky. It’s like lardon from the sea. Take a look around and take some pictures. It’s ok, everyone else is doing it too. Even before Bourdain brought foodies all over the country here, this place has been already been written about and raved by just about everyone from Conde’ Nast to Bon Appetite. Don’t forget to bring cash. These guys are old school through and through. Stay Tuned for Day 2 – Mission Chinese. Which is better? SF or NY?